How do I find Sutori in the Clever Library? How do I get a consumer key and shared secret for LTI integration? How do I setup Sutori in Canvas as an Instructor? How do I setup Sutori in Schoology as an Admin? How do I setup Sutori in Canvas as an Admin? How do I setup Sutori in Moodle as an Admin? How do I setup Sutori in Schoology as a Teacher? How do I setup Sutori in Moodle as an Instructor? You can access Sutori in Clever&apos;s Library. 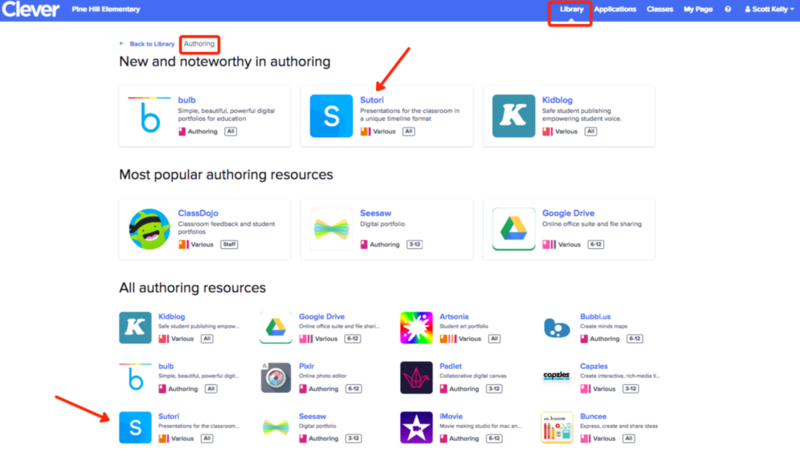 Sutori can be accessed under the section "authoring". In a couple of clicks, you can install Sutori for you and your students.